Wikipedia says that Fetal Heart Rate (FHR) should be between 110 beats per minute (bpm) 160 bpm. Anything beyond this range is considered abnormal. These rates are called baseline rates. FHR baseline rate is the same no matter which culture or nation the baby is born into. 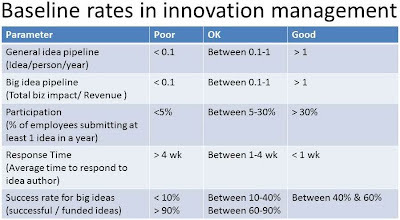 Are there any baseline rates in innovation management similar to FHR baseline rates? I don’t know. However, I feel that we need to establish them as they are going to be very useful in making various decisions in managing innovation. Nobel Laureate Daniel Kahneman highlights in “Thinking, fast and slow” that baseline rates are a good starting point while making risky decisions. In this article, I present my current view and a first attempt at the baseline rates relevant for innovation management. Let me qualify the data set first. These rates are based on the data from 25 to 50 organizations depending upon the parameter. There are some parameters like the “idea per person per year” and “participation” where data is available from more organizations (50). And there are parameters like “response time” and “success rate” for which data is available from fewer organizations (25). Moreover, these numbers are not averages. 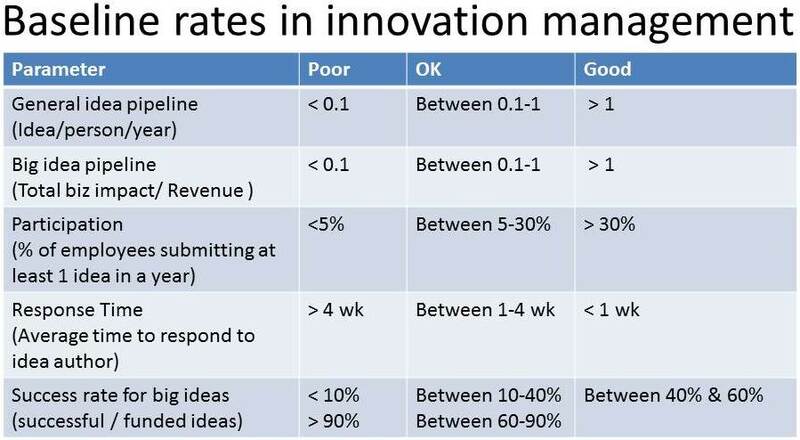 Like FHR baseline, they are linked to the health of the innovation engine. Currently I have used my judgement in calling some rate “poor, OK or Good”. I have used publicly available information such as INSSAN benchmarks as well as data published from companies like Toyota and P&G. Moreover, I have also used data from a dozen odd organizations where I have seen the innovation engine personally. Idea pipeline (General): This parameter says that if you are 1000 people organization and if you have an idea box (physical or on intranet), then you should get at least 1000 ideas in a year to qualify for “good” category. If you get, say 150 ideas, then you are OK. And if you get 70 ideas in a year then you are poor. The maximum number I have seen is from Brasilica (a Brazilian firm) is at 143. Big idea pipeline: Many organizations manage a separate pipeline for large impact ideas. Take each idea in the pipeline and identify how much business impact (annual) it projects today. Let’s say your big idea pipeline has 3 ideas with following potential revenue: 1 crore, 3 crore, 1 crore and if your revenue is 100 crore then total business impact of the pipeline is: 1+3+1 = 5 and the ratio of total business impact to revenue is 5/100 = 0.05. The table says it is “poor”. GE’s breakthrough imagination has 100 ideas each with a minimum potential of $1 billion. That makes the ratio at least 0.67 (perhaps the actual ratio is > 1). Participation: Less than 5% employees giving at least one idea in a year is “poor”. More than 30% doing the same is “good”. See here how this parameter evolved in Toyota over 40 years. Response time: How soon are you getting in touch with the person who submitted an idea? Less than a week is “good” and more than a month is “poor”. For example, Shell Gamechanger process promises to communicate input on your idea within 48 hours. Success rate: This is the trickiest parameter. Too high of a success rate may mean nobody is taking any risk. Check out my article “Lower your batting average to improve innovation productivity”. Will these baseline rates change as we get more data? Yes. Will the role of baseline rates diminish? I doubt it. As I mentioned this is my first attempt and your inputs would be greatly appreciated.